Let us understand it as below. If somebody says in English “this” then it does not convey you a complete message. The front person will ask you, what do you mean ? The term “this” can be anything. It can be computer, table, house etc. 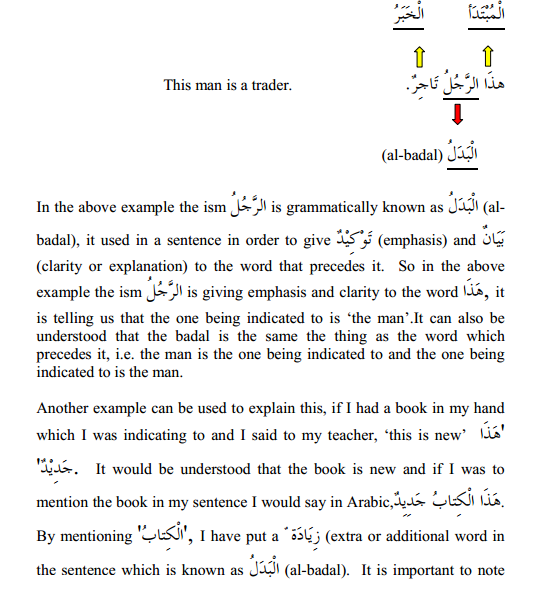 If somebody says again in English for example “this book”, then also it is not providing us the complete explanation about the book except that the term “book” has just substituted the term “this”. Hence the phrase “this book” is also not a complete sentence. It is not giving any complete idea or information about the object “book”. Here الْــكِــتَــابُ is termed as بَدَلْ and هذا is termed as .مُبْدَلْ مِنْهُ Badal should match all the characteristics of Mubdal Minu. Now let us understand “This is a book”. This statement is a complete sentence. Its translation is as below. 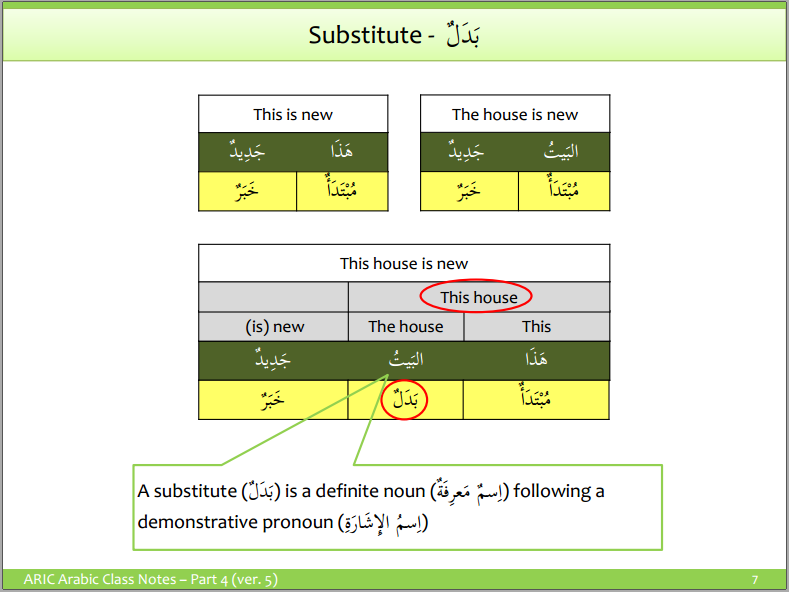 In the above statement هَذا is the subject and كِــتَــابٌ is the single word predicate. State TRUE or FALSE: Read the verse Quran (18:6). هَذا الحَدِيْثِ is a Badal- Mubdal Minhu construction. State TRUE or FALSE: Read the verse Quran (18:54). هَذا الْقُرأَنِ is Badal-Mubdal Minhu construction. State TRUE or FALSE: The phrase ذلك الْكِتَابُ (That book) is not a Badal-Mubdal Minhu construction.